In the sequel to the critically acclaimed The Strange Case of the Alchemist�s Daughter, Mary Jekyll and the rest of the daughters of literature�s mad scientists embark on a madcap adventure across Europe to rescue another monstrous girl and stop the Alchemical Society�s nefarious plans once and for all. Mary Jekyll�s life has been peaceful since she helped Sherlock Holmes and Dr. Watson solve the Whitechapel Murders. Beatrice Rappaccini, Catherine Moreau, Justine Frankenstein, and Mary�s sister Diana Hyde have settled into the Jekyll household in London, and although they sometimes quarrel, the members of the Athena Club get along as well as any five young women with very different personalities. At least they can always rely on Mrs. Poole. 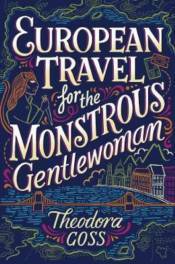 Racing against the clock to save Lucinda from certain doom, the Athena Club embarks on a madcap journey across Europe. From Paris to Vienna to Budapest, Mary and her friends must make new allies, face old enemies, and finally confront the fearsome, secretive Alchemical Society. It�s time for these monstrous gentlewomen to overcome the past and create their own destinies.